I received an email last night, from our local councillor that made my heart sing! As you may have read in previous posts, Mr.Green and I had a goal this year of installing a solar panel to run our downstairs lighting. Mr.Green is currently building his own LED bulbs – how cool is that guy?! and they are running off a car battery. (You wouldn’t believe how long they run without a recharge). We live in a Conservation area, so unfortunately, we will still need to apply for planning permission. But I am thrilled that around the country, other people will be able to take advantage of this huge leap forward by the Government. Take a look at the fabulous Yellow House site for information on how ‘ordinary people’ I’m sure Annie and George will find it in their heart to forgive me for writing such a thing :D) in their ‘ordinary home’ have made it an environmental dream by reducing energy consumption by two thirds. 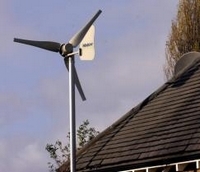 Do any of you have renewable energy solutions installed in your home – How are you getting on with them? Will this new legislation give you the push you need to install renewable energy in your home? Be interesting to hear how the DIY LED lightbulbs go! There will be a full post in the near future. For now, we are successfully running a few LEDs in the kitchen. Mr. Green has built light bars under each wall cupboard to light the work surfaces and hob, plus a few in the centre of the ceiling. You’re probably aware that LEDs are very different to incandescent in that they are more directional. So you need either to have lots of them to light a room, or change the way you use lighting to point them to various places. They are running off a car battery just as an experiment at this stage. They go literally for days before we need to recharge the battery (this is being done from the mains at the moment, but our aim is to run them from a solar panel).